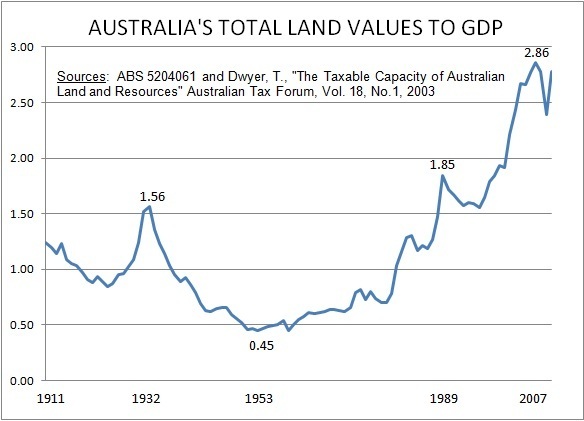 As a comment on the penultimate post, AusHousingCrash recommended I update my chart of Australia’s total land prices to GDP going back to 1911. Don’t be misled by the 2007 on the X axis, that was the peak. The last year of the graph is actually 2010. NOTE: Over the years the average land values relationship to GDP has been about 1:1, so might I suggest 2.86 is looking a bit ‘toppy’? Previous PostMINDSET CHANGERSNext PostSIGN THE PLEDGE? I used seasonally adjusted GDP right through. Does that make the difference?